Spinal Fusion or Disc Replacement? Disc Replacement often referred to as “ADR,” artificial disc replacement (or simply disc replacement) involves removing a damaged or compromised disc in the lumbar or cervical spine and replacing it with an artificial disc, a specially-designed implant created to mimic the natural function of the disc. By inserting the artificial disc into the spine in place of a damaged or deteriorated disc, the normal movements and strength of the spine can be restored. Restoring normal motion and strength at the level of the artificial disc also assists discs at the levels above and below the artificial disc by alleviating any additional strain caused by a deteriorated disc, or a fusion designed to treat a deteriorated disc. Dr. Spiller, Chief Surgeon describes this process in more detail in the book. From start to finish, disc replacement surgery usually takes our team less than 75-minutes, and that includes 2- and 3-level disc replacements as well. These procedures can be done in a very efficient manner because of the number of surgeries we have performed together as a team and due to the fact that we perform disc replacements many times a week on average. Because the surgery is short, the patient is under anesthesia for only a short time. Side or lateral view of a properly implanted Spinal Kinetics M6-L Lumbar Disc Replacement Implant. The design of the implants themselves varies siginifcantly and has for years; initial efforts at disc replacement involved borrowing successful technology from knee and hip replacements in an effort to incorporate them into spinal treatment. Surgeons had been replacing knee and hip joints for many years, so such methods were taken and employed for the spine. The initial results were promising but imperfect. Early artificial discs involved a ball-and-socket style joint. While this is a perfect type of joint for a hip, it is not the perfect solution for the spine. Early artificial discs (and even some current ones used in North America today) allowed too much motion, more than a natural disc allowed. This additional motion had the potential effect of placing more pressure and strain on surrounding tissues and structures. Early discs also tended to “migrate” or move out of optimal position. This caused several challenges and, in time, required removal or replacement of the implant. Lastly, while disc replacements have advanced over time, nearly all implants lacked another critical function of the disc: shock absorption. The spine is, among other things, like a large shock absorber that allows us to move, run, and jump without sustaining injury. 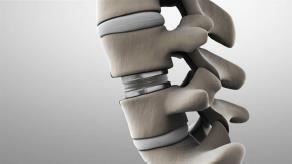 The spine accomplishes this through a combination of curvature of the spine and the compressible nature of the discs. Each disc in your spine can compress a small amount. Multiply this amount across all the discs, and you have a very effective shock absorber for the body. The early artificial discs could not compress at all, so they lacked this important function. Over the years, several generations of artificial discs have been developed. The latest and most effective ones restore the proper amount of motion to the spine and provide an amount of compression or shock absorption similar to a natural disc. The first disc to effectively incorporate shock absorption is the M6 disc from U.S.-based Spinal Kinetics. Unlike other implants, the M6 allows motion in all planes, but in a way that is limited like the natural disc. It allows forward, backward, and side-to-side bending. It also allows twisting. But the limited compression of the disc makes this disc the first to truly replicate a normal disc. Because it is constructed from a combination of rigid and flexible materials, it provides a level of shock absorption very similar to a natural disc. Only with the M6 prosthesis, which we have been using in the cervical spine since 2005 and in the lumbar spine since 2009, has a prosthesis become available that can biomechanically mimic the natural disc. In addition, the M6 prosthesis has been thoroughly investigated biomechanically and has shown very high durability in testing. The M6 prosthesis can complete 30 million cycles of motion without exhibiting any significant wear or damage. This means the prosthesis will likely last at least 60 to 75 years before suffering wear. This is far superior to the wear cycle of the human disc. For this reason, the M6 disc is preferred around the world by spinal surgery teams that specialize in artificial disc replacement. In fact, as of the writing of this book, over 43,000 M6 discs have been implanted worldwide. Artificial disc replacement has now been shown to be far superior to traditional fusion for the vast majority of patients with degenerative disc disease. 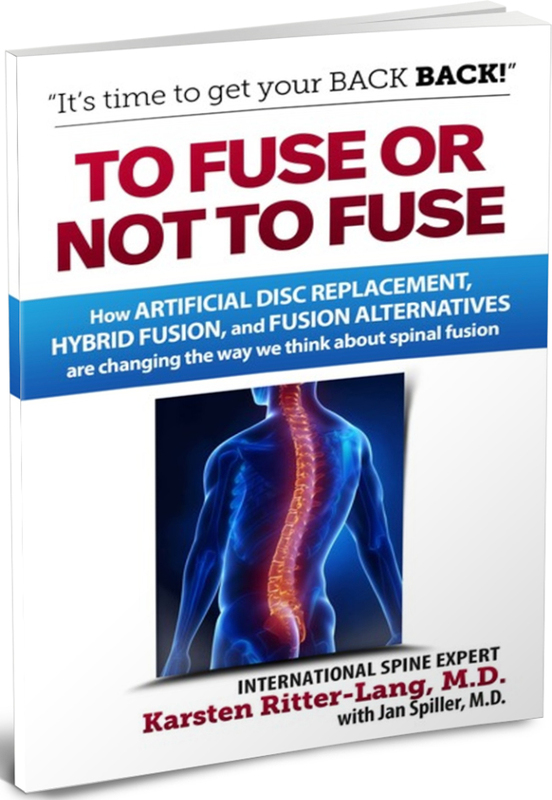 While fusion is sometimes still indicated, many spinal fusions can be avoided through effective artificial disc replacement, and usually with far superior results. In addition, disc replacements at multiple levels are quite common and can be performed without increased complications. While there is a common understanding among many people that more fused levels equal more problems, the same is not true for artificial disc replacement. If the proper implant is used, the artificial disc mimics the natural disc. Therefore, the presence of multiple artificial discs does not increase the likelihood of short or long-term complications. Many patients, rather than undergo a multiple-level fusion, will have multi-level disc replacement. Where indicated, two-, three- and four-level disc replacement can be accomplished in one surgery and with excellent results. While it is rare that we would implant four artificial discs, it can and has been done with superb results. In fact, we find that the complication rate for multi-level interventions is roughly the same as for single-level interventions.